For Oily Hair & Scalp! Cleanse and hydrate without the weight. Enriched with Lemongrass and Juniper berries, known for their purifying properties, to cleanse, clarify and reduce excess oil without over drying the hair or scalp. Silicone free. Aqua (water), Sodium Lauroyl Sarcosinate*, Lauryl Glucoside*, Sodium Lauryl Sulfoacetate*, Cocamidopropyl Hydroxysultaine*, Disodium Cocoamphodiacetate*, Glycerin*, Sorbitol*#, Citric Acid*, Sodium Citrate*, Sodium Gluconate*#, Glyceryl Laurate*, Sodium Cocoyl Glutamate*, Pelargonium Graveolens (Geranium) Flower Oil*, Rosmarinus Officinalis (Rosemary) Leaf Oil*, Cymbopogon Schoenanthus (Lemongrass) Oil*, Citrus Aurantium Dulcis (Orange) Peel Oil*, Citrus Nobilis (Mandarin) Peel Oil*, Juniperus Communis (Juniper) Fruit Oil*, Eugenia Caryophyllus (Clove) Leaf Oil*, Sodium Hydroxymethylglycinate, Limonene^, Citronellol^, Citral^. Massage into wet hair, adding more water to build natural lather. Rinse & reapply if necessary. Recommend patch test before use. 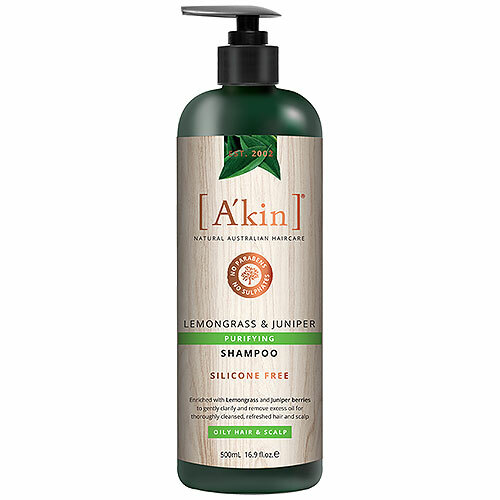 Below are reviews of A kin Lemongrass & Juniper Shampoo - 500ml by bodykind customers. If you have tried this product we'd love to hear what you think so please leave a review. This shampoo smells amazing and leaves my hair feeling really soft and shiny after use. I have to use it twice per shampoo to get a good lather but I don't mind as I know this is due to no nasty sulphates. I'm noticing an improvement in my hair since using this and it isn't as dry as it was.